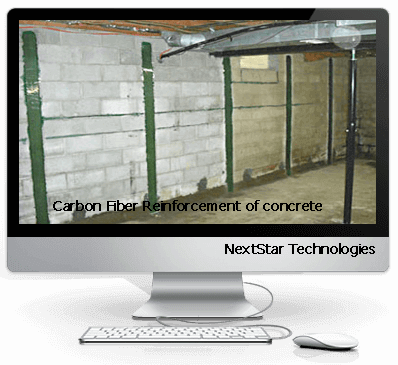 NextStars easy to use carbon fiber fabric wall reinforcement kits that can also be used on irregular shapes such as corners , retaining walls and any vertical or horizontal wall. 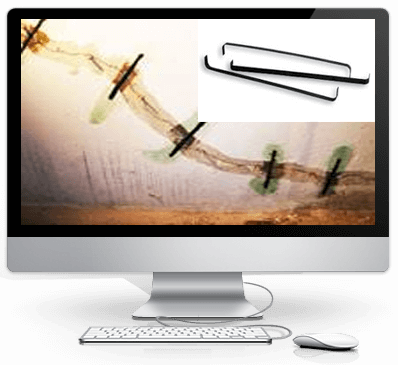 Fortress carbon fiber staples and Stitches are a preferred product for angle cracking used on foundation walls and concrete swimming pools. They have been used for many years with proven results. Carbon Fiber Stitching and staples are a cost effective solution to prevent re-cracking of concrete floors, walls and is a preferred solution before any floor coatings are applied. 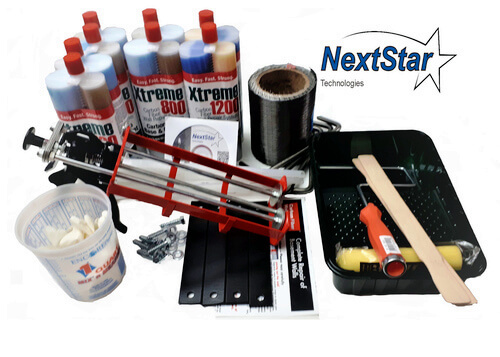 Fix your foundation walls like a pro and stop them from bowing further with NextStar’s revolutionary DIY wall repair kit. This advanced wall repair kit combines the unrivalled strength of aerospace and military-grade carbon fiber with the ease of a regular wall repair patch kit. 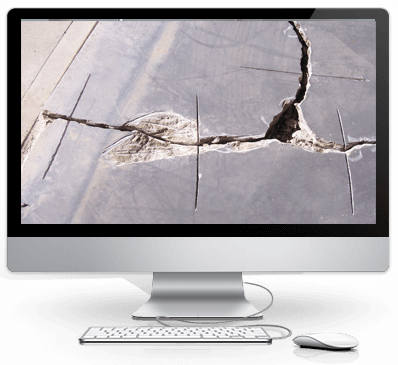 The product is a lightweight, ultra-strong, and durable wall repair solution that’s built to last. This carbon fiber reinforcement kit combines all these advantages into one neat DIY solution that’s so easy to use that anybody can use it to fix the crack in their wall. There’s no heavy lifting involved. 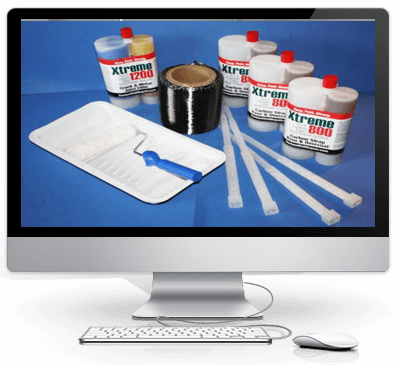 You can reinforce your concrete wall, or any other type of foundation wall with this wall repair kit and be done with it in your free time. That easy. 1. Wire brush the bare concrete wall’s strap locations. 2. Apply the Xtreme1200™ in the horizontal cracked mortar areas and where the vertical carbon fiber strap will be laid. 3. Smooth out and push the Xtreme1200™ into the crack and the horizontal mortar areas. 4. Now eject the Xtreme800™ into the paint tray (tray and roller provided in our kit). Note: Due to temperature changes, always hand mix Xtreme800™ with a wooden paddle in painting tray to secure the proper mix. 5. Roll a coat of the Xtreme800™ onto the vertical area between the vertical mortar of the cement blocks where the carbon fiber strap will lay. 6. Be sure that vertical area is well saturated with the Xtreme800™. 7. Unroll the carbon fiber strap onto the moist Xtreme800™. 8. Work out any air pockets or wrinkles. 9. Roll on top another coat of the Xtreme800™. 10. After a couple of days of drying, paint over the carbon fiber strap with regular wall paint. The strap is very unobtrusive and hides well when painted. The carbon fiber is a super-rigid construction material. Our wall repair kit allows you to physically bond carbon fiber with the concrete of your foundation walls. Once you are done, the concrete wall’s movement is constrained by the carbon fiber strap, which features an extraordinarily high tensile strength and does not yield or stretch one bit. In fact, carbon fiber’s rigidity is as much as 2 to 5 times that of steel. As a result, the wall is prevented from bowing any further. Carbon fiber, one of the strongest materials in the world, has been prohibitively expensive for decades. It is only recently that it became affordable enough to find commercial applications. Even then, it was a purely commercial-grade material, and the regular consumers had no access to it. It was typically used for extreme-strength applications like concrete bridges, multilevel parking structures, high-rise buildings, and so on. 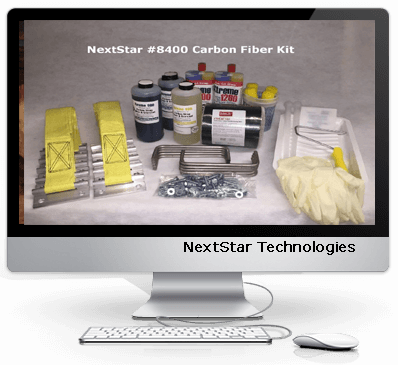 Our Carbon-Fiber-Reinforced Polymer-based wall repair kit brings this space-age material to you – in an entirely do-it-yourself form. 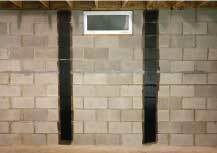 For block walls, repair patch kit features a superior top and bottom wall anchor system. What’s more, it’s affordable, it’s incredibly easy to use, and it prevents your wall from bowing any further – even a fraction of an inch. As you can see, no experience required whatsoever. 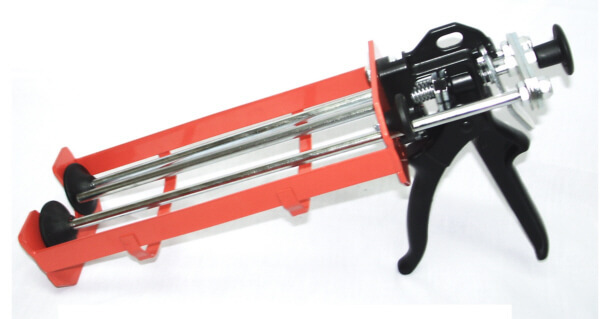 These kits can be used to create wall supports for bowing walls like Bowed cracked cinder block walls and bowed cracked poured concrete walls. They can also be used for reinforcing retaining wall and cracked concrete corners, and even for separating concrete attachment walls. This DIY Carbon Fiber Wall Repair Solution is an entirely hassle-free, clean, and refreshing installation. It doesn’t require you to dig around or on the wall. It doesn’t create a huge mess either. More importantly, it’s a maintenance-free installation. You install it once, paint over it, and forget about it. The astonishing strength of carbon fiber translates into extra-durable wall supports in the form of straps. So, you never have to worry about them failing. That means huge savings on the future wall repair jobs that you’d inevitably make when using traditional materials like steel or concrete.